The new XPS 13 from Dell was highly praised by tech sites and blogs all over the world and this is quite understandable. The vendor has managed to pack a serious powerhouse in a tiny package that’s not only thin, but also really compact with almost bezel-less 13-inch screen. Also, the design signature follows the usual path of Dell’s products but somehow adds an inimitable charm. You may easily find this model reviewed in almost every tech site, but what about the budget variant? We got our hands on the “budget-friendly” variant, which isn’t close to budget whatsoever, but it is offered for much less money than the original. This one packs a less detailed screen (1920×1080), slightly slower CPU (Core i5-5200U), less RAM (4GB) and, of course, less storage space capacity (128GB). It’s also important to note that this configuration lacks the touch-capacitive screen and if you really like the model you can get it for about €300 less, which is a great bargain if you are willing to sacrifice all the things mentioned above. So how does it stack up against its more powerful brother? Let’s find out. 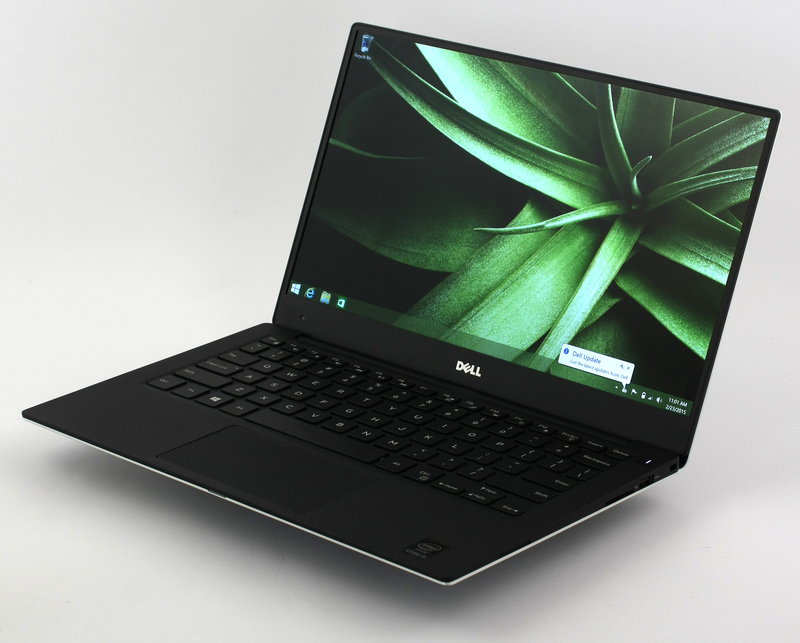 Before we begin, we strongly recommend watching our video review of the new Dell XPS 13. As we mentioned in our hands-on review a few weeks back, the XPS 13 comes with soft-touch, small black box that just screams “premium” all the way. Opening it will reveal the usual user manuals, AC charger, and cable as well as DVD with drivers. Dell XPS 13 is more than it meets the eye. Seemingly the ultrabook’s chassis has two main aluminum plates on the top lid and the bottom, but actually that’s not quite true. The inner frame is made of carbon fiber, thus making it more resistant to impact and cutting of weight at the same time. Then we’ve got the aluminum plates on the top and bottom of the machine. It actually looks like a premium sandwich, which you are not allowed to eat. 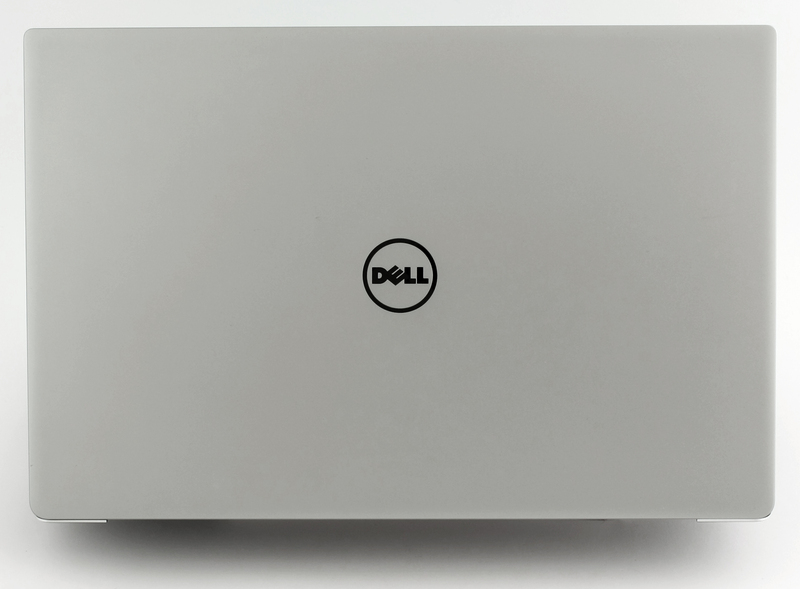 Let’s begin with the lid, which we already said that it’s aluminum made with anodized metallic finish along with Dell’s logo in the center. On the other side of the lid is located the 13-inch screen with super-thin bezels, which we can only see in the smartphone industry. This kind of design greatly reduces the overall size of the machine making it more compact and, of course, more attractive. However, the webcam isn’t missing and it’s located in bottom left corner along with the integrated microphone. The bottom piece features the same anodized metallic aluminum with two long rubber “legs” and a big grill for heat dispersion, which is most probably intended for an external cooling pad. But this isn’t the main grill, as the other one is located right between the hinge and the main body. 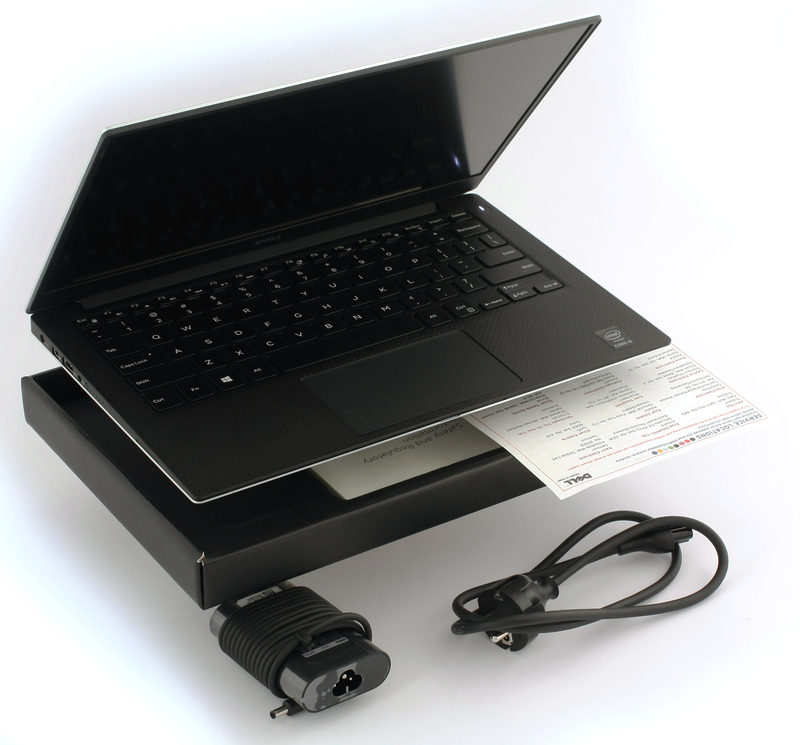 Similar cooling design can be found in the Lenovo Y50 and Dell Inspiron 7548. 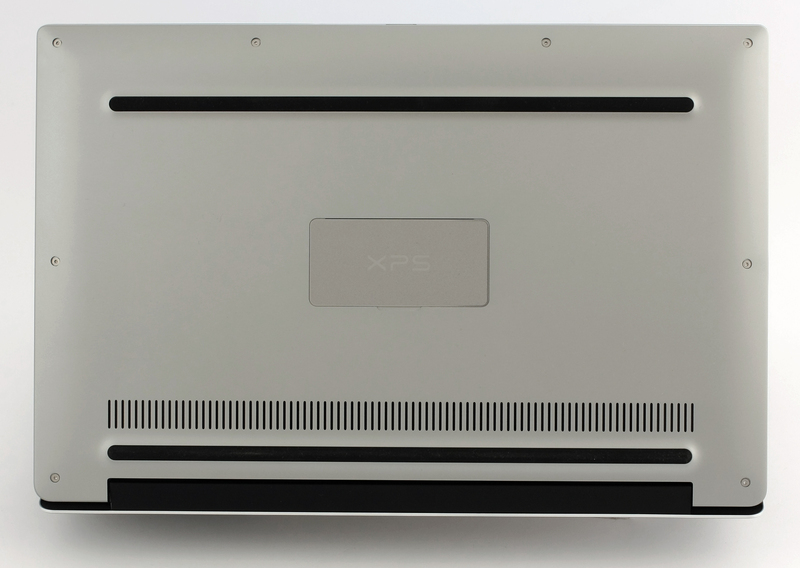 There’s also a small cover with the XPS logo on top of it and its only function is to hide the usual serial numbers, certification signs and etc. This way the design isn’t ruined by some random signs and text. Pretty neat idea. The sides of the machine feature a soft-touch rubberized plastic that feels really nice. The back of the XPS 13 has 15 mm thick profile and declining to just 9 mm at the front, where can only be found just one LED status light (again similar to the Inspiron 7548), which is flashing in orange when you need to charge it and in white when battery level is good. On the left can be found the DC charging port, mini HDMI, USB 3.0 and 3.5 mm jack. Also, there is a small button right next to the audio jack which indicates the battery level by pressing it. There are 5 little LED lights and each of them represents about 20% of battery level so you can easily check your battery status without turning on the computer. On the other side is located only the SD card reader and one USB 2.0 port. Despite the amazing and clean design of the exterior, our favorite part of the device is the interior. It’s completely covered with the same soft-touch rubberized plastic material we mentioned earlier and its transparency makes it easy to see the inner carbon fiber frame. It adds some charms to the notebook and makes it not only premium, but also might appeal to the more “geeky” customers. The material feels absolutely astonishing and it doesn’t leave smudges easily. 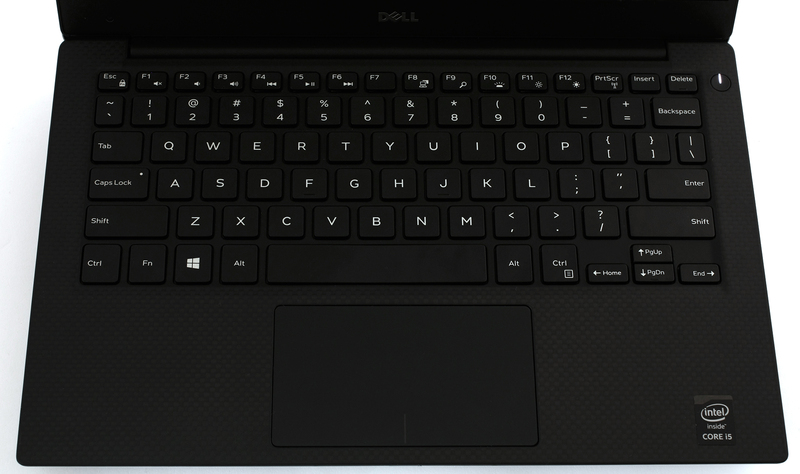 The keyboard is another great feature of this XPS 13. Quite big buttons for a 13-incher, but with short travel, which doesn’t mean it’s less comfortable for typing – you will probably need just to adapt. It also has effective LED backlight and nearly perfect touchpad. Despite its size, the touchpad feels nice to touch, since it’s made of aluminum plate, and offers long and tactile feedback when pressing it. However, we found it unresponsive at times when using gestures like two-finger scrolling and such. That’s why we can describe it as “nearly perfect”. Dell has made not only beautiful and premium design of the new XPS 13, but also quite practical and compact. The weight (1.36kg) and the thickness (9-15mm) are just one of the things that make this device worthwhile. The nearly bezel-less screen makes the device even more compact and pleasing to the eye. When you add the inner carbon fiber frame, there’s not much bad we can say about the design. 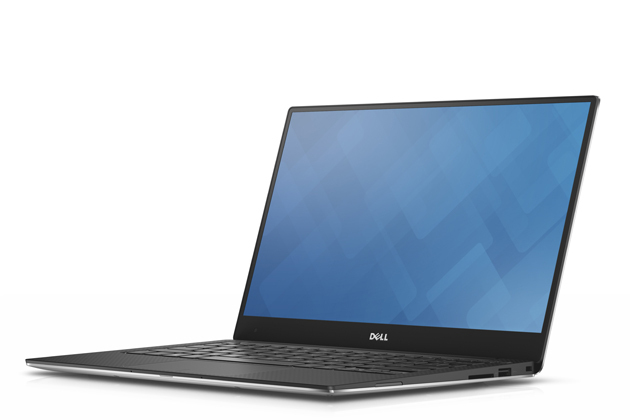 In this version of the ultrabook, Dell has used IPS Sharp panel with model number LQ133M1 with Full HD (1920×1080) resolution and 13.3-inch diagonal. The aspect ratio is the usual one – 16:9 and at this point we have 166 PPI (pixels per inch) pixel density. Also, the length between each pixel is 0.153 x 0.153 mm. The display becomes “Retina” (the point when the human eye can’t see the pixels) when viewed over 53 cm. Here is a photo of the model viewed under microscope and white background. The photo below represents the quality of the image when you look at it from 45° angle and due to the IPS technology there is no image distortion. The maximum brightness we were able to measure is 217 cd/m2 with a deviation of only 9%. The brightness level is enough for a comfortable work in a light room and the deviation is neglectable. Keep in mind though that 217 cd/m2 brightness might not be enough for working outdoors, but at least the matte surface of the screen will come in handy. The color temperature is 7415K (measured at maximum brightness) – this is considered as a bit cold and also far from the optimal one – 6500K. The deviation is recorded in the top left corner of the screen. The XPS 13’s display covers 96% of the sRGB and 73% of the Adobe RGB color gamut. Almost all of the WEB-based colors can be reproduced. The measured gamma aligns perfectly to the optimal one (2.20), which guarantees accurate color brightness across all brightness levels. We’ve calibrated the display with a priority of 6500K color temperature at maximum brightness. Colors appeared to be quite accurate right before the calibration with average deviation of DeltaE(1976)=1.19. Unfortunately, Dell XPS 13’s display has PWM (pulse-width modulation) across all brightness levels, which is considered to be harmful to your eyes. The good news is that the emitted frequency of the light is faster than usual, which means that your eyes will not get tired so easily. Also, we were able to replace the old virtual oscilloscope with a new one, which can be considered much more accurate. The display used in the budget variant of the XPS 13 has numerous advantages, but it does not lack of disadvantages. For starters, the panel has high color gamut coverage, high contrast, accurate color reproduction (without calibration), and has a high pixel density due to the size of the screen and the resolution. However, there are several drawbacks that are not easy to neglect – low maximum brightness level (217 cd/m2), high color temperature, and has PWM across all brightness levels. The sound which the loudspeakers reproduce is way above average and it resembles the qualities of an external sound system. Also, there was a significant difference between sound reproduction from VLC and Windows Media Player. The VLC was able to reproduce better sound quality (the green line), while the Windows Media Player failed to deliver (yellow line). The ultrabook uses relatively big battery (4-cell, 52WHr) and a small display packed with a lot of pixels, also it offers a power-efficient hardware (Core i5-5200U, 14nm FinFET manufacturing process), so we can expect some good battery performance. We ran the usual tests like web browsing, watching a movie and gaming. All of the tests share the same conditions – Wi-Fi turned on, Bluetooth is off, power saver is on and screen brightness is set to 120 cd/m2. Excellent result – 465 minutes (7 hours and 45 minutes). Outstanding result and the interesting part is that it’s way higher than the browsing time – 640 minutes (10 hours and 40 minutes). This test got the most of the battery, since it’s the most demanding one – 141 (2 hours and 21 minutes). Here you can see an approximate comparison between the CPUs that can be found in the Dell XPS 13 9343 models on the market. This way you can decide for yourself which Dell XPS 13 9343 model is the best bang for your buck. Fritz is a chess benchmark which tests the computing capabilities of the CPU with various chess moves. The Intel Core i5-5200U managed to get 5.045 million moves per second. For comparison, one of the most powerful PCs, Deep(er) Blue, was able to squeeze out 200 million moves per second. In 1997 Deep(er) Blue even beat the famous Garry Kasparov with 3.5 to 2.5. Intel HD Graphics 5500 is a GT2 graphics chip, built into Intel’s Broadwell Core i series of processors. It was announced on January 1, 2015, its goal being to stand against NVIDIA and AMD’s low-end dedicated graphics cards. The HD Graphics 5500 has 24 shader cores, known as ‘unified units’, 4 texture cores and 1 raster core. They support DirectX 11.1, Pixel Shader 5.0, OpenCL 1.2, OpenGL 4.0 and Quick Sync encoding. Base frequency is 300MHz, and TurboBoost can increase that up to 950MHz depending on the processor. Power consumption is drastically lower when compared to NVIDIA and AMD’s discrete graphics solutions. The controller also produces less heat, since it is part of the CPU package. This makes GT2 graphics accelerators the most desirable in the ultrabook class of portables. Here you can see an approximate comparison between the GPUs that can be found in the Dell XPS 13 9343 models on the market. 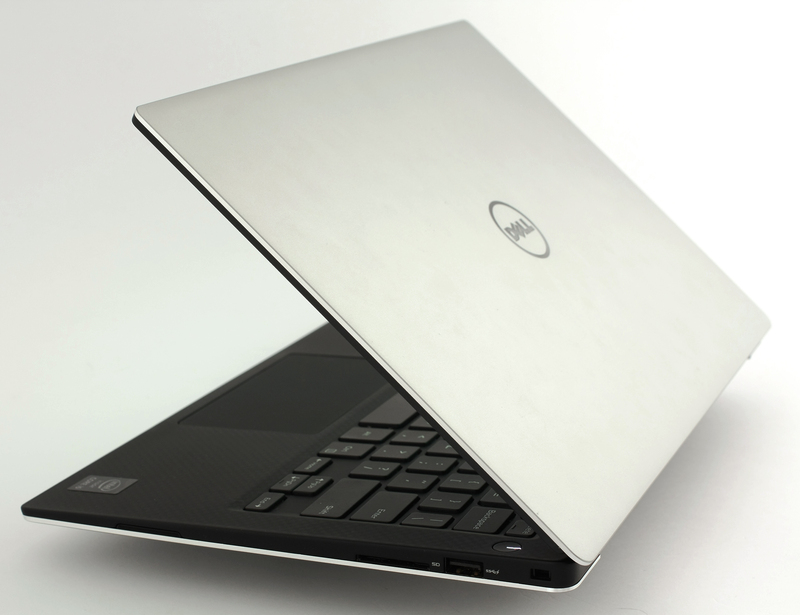 This way you can decide for yourself which Dell XPS 13 9343 model is the best bang for your buck. We are fully aware that the XPS 13 is not intended for gaming, but we ran the test just for comparison and evaluation reasons. As usual, we’ve run a few tests in order to stress the system at maximum load, starting with the CPU. The CPU stress test ran for about an hour to see how hot the processor gets and check if there is any excessive throttling. At first the CPU ran at 2.7GHz, but for a brief time, since the CPU is designed to boost its frequency at 2.5GHz when there are two active cores and 2.7GHz when only one is active. For an hour, the CPU was running at approximately 2494MHz and operating temperature around 78-81°C, which is far from the danger zone (100-105°C – this is the maximum operating temperature). At normal state, the CPU runs quite cool – around 51°C. You can see on the diagram below the temperatures which the CPU reached (red line) and the load (green line). 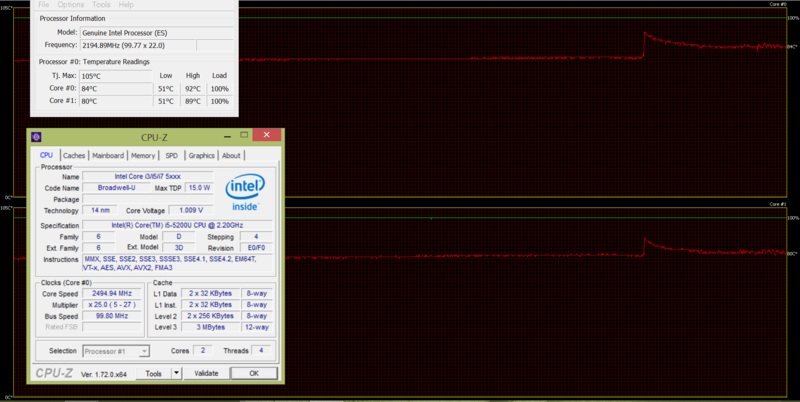 After an hour, we’ve included the GPU stress test to see how the SoC can handle the extra load. As expected, the CPU began throttling as it failed to deliver the promised 2.5GHz operating frequency. This is quite common when testing CPUs with integrated graphics and if you go through our latest reviews you will see the pattern. However, the CPUs frequency dropped at 1.5GHz, and the temperature rised a little – 89-92°C, which is pretty close to 105°C, but still away from the danger zone. It’s also important to note that the ultrabook runs relatively quiet and you might hear some excessive “buzzing” only when pushing the notebook to its limits. We were surprised by the noise of the little fan packed inside the chassis, though. It’s important to note that the scenario above is highly unlikely to happen to a normal consumer. Practically, it’s almost impossible to reach such high loads with only running everyday tasks and applications. On the heat map below can be seen how the temperatures affect the exterior and where the average consumer might feel the extra heat. We’ve recorded some high temperatures at the top of the keyboard, near the display – quite normal since the CPU is located right beneath, along with the grill for dispersing the heat. Nevertheless, those temperatures aren’t high enough to affect user experience. Also, the area where palms rest remain cool, thus making the cooling system relatively effective. 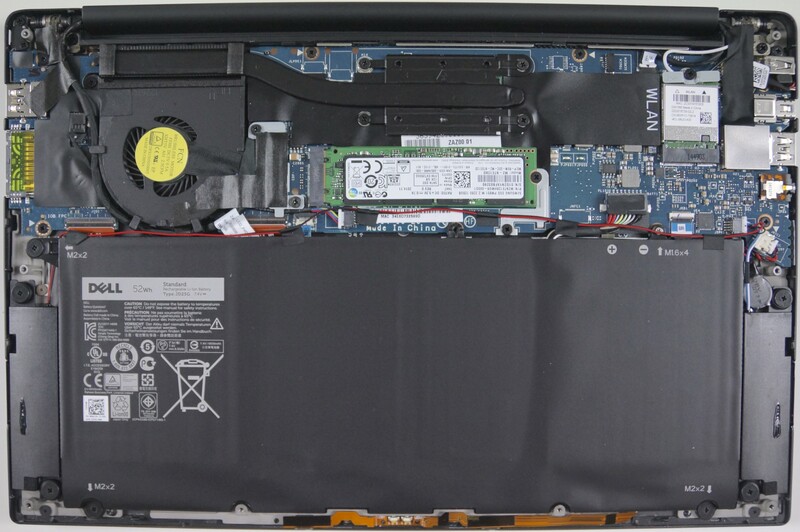 We’ve also provided an image of the internals of the machine and as you can see the new XPS 13 uses M.2 SATA SSD for storage device, which in our case is 128GB and the manufacturer is Samsung. It’s quite a let down to see that an expensive ultrabook like this uses SATA type of SSD with B and M key adapter and not the PCIe one, which means slower read and write performance. However, we see that Dell has crammed up inside a relatively big battery (taking most of the space inside) and the cooling solution works just fine. It also provides extremely easy disassembly, as long as you are looking for just an upgrade or cleaning the CPU fan. Only a few unscrewing needs to be done and you are good to go. However, the display has some great properties along with big disadvantages and the most notable one is the screen flickering across all brightness levels. At least you will have really good color reproduction and color gamut coverage. Also, you might want to reconsider if you are going to used it outdoors, since the maximum screen brightness isn’t high enough for comfortable use. Another matter you might want to consider is the price. For around €1500 you will surely find some other great offers. We would have expected a bit better hardware, like Core i7 CPU and at least 8GB of RAM. The storage is also really limited – only 128GB. Maybe that’s the price you have to pay for luxurious and practical design and, of course, excellent battery life, which is really important nontheless. Great review! 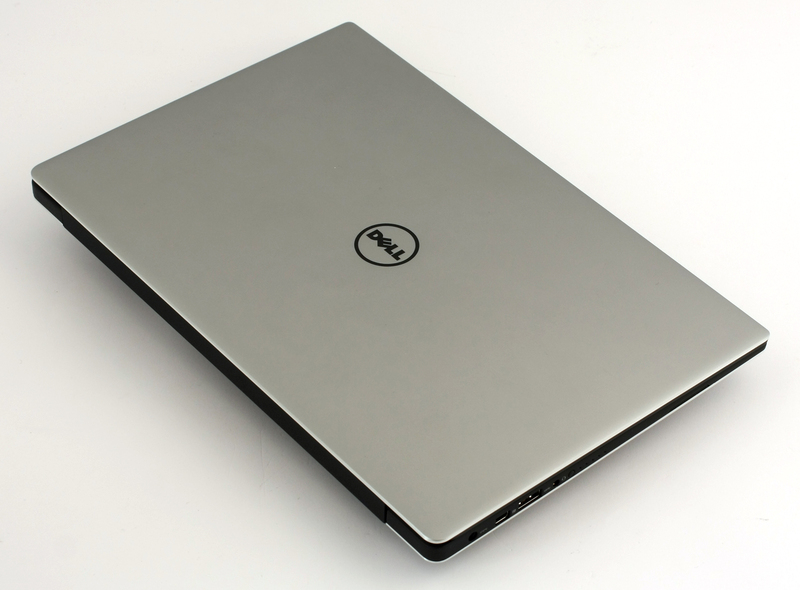 Could you also make a review of Dell Latitude E7450 with the FullHD matte, non-touch display. I read that it uses a display that uses no PWM backlight (it is alledged that the same is used in the thinkpad T450s fullHD non-touch version). It’s my favorite site now. It first site with very well rewiew of notebook screens.Especially thank you for pwm! It’s very important. very nice. Thank you ! ps some people write that macbook retina screen without pwm. I think there are very high pwm or something else. Series Zbook are with Dreamcolor screen. It’s intresting screen too. Will you test it in future? All important consideration point are covered for me, this is a great concise review.